Recently we’ve had a lot of requests about which of our materials are vegan and how artists can cut down on their use of supplies containing animal products, so we were delighted to hear about Sandrine Maugy’s quest to find the best vegan watercolour products. She has very kindly talked us through her tips for finding vegan paints, vegan paper and the right vegan brushes for different techniques. For a lot of people, being a vegan is not only a way of eating, it is also a way of living. Eating exclusively plant-based food while using brushes made of real sable hair coming from fur farms wouldn’t make much sense. 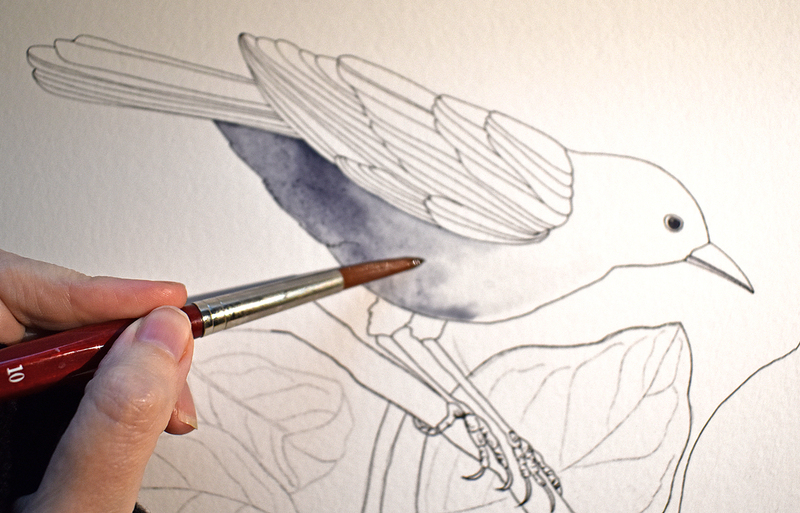 While brushes are an obvious example, diverse animal parts can sneak in unobserved in other watercolour materials. 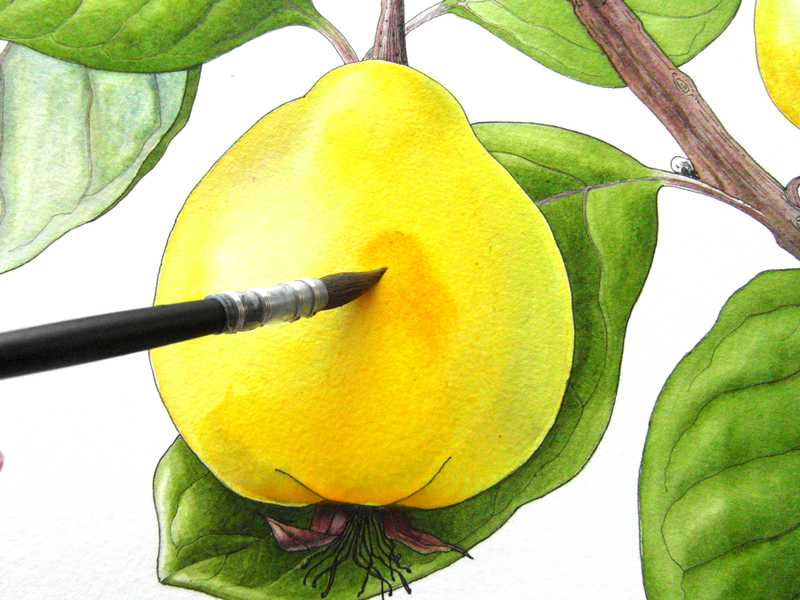 Here are a few watercolourist art materials that are safe for a vegan art practice. Paints need a binder and this can sometimes be made of animal products: Sennelier and Jackson’s use honey, while Schmincke and Winsor & Newton use ox gall. Daniel Smith and QOR watercolours are vegan friendly, as they use synthetic binders. They also both use a high concentration of pigment, which produces bright, saturated colours. Even if the binder is vegan, keep in mind that the pigments might not be. Bone Black is made of charred bones so any colour that has the pigment Pbk8 in its formula contains animal bones. Genuine Sepia is made from squid ink and Indian Ink from crushes bugs. Thankfully, a lot of animal derived pigments such as Scarlet and Indian Yellow are now obsolete and have been replaced with modern, more reliable and animal-friendly pigments. Watercolour papers are made of rag, cotton or sometimes wood pulp. The best quality papers are pure cotton. The animal product element comes with the sizing. To give them resistance to washes, papers are sized internally and usually externally with a glue that can be made of animal gelatine. Saunders Waterford and Arches both fall into this category. Fabriano on the other hand, stopped using animal gelatine a long time ago and all their papers are now vegan friendly. Canson Heritage, Stonehenge Aqua, Canson Moulin du Roy and Winsor & Newton Professional all use vegetable or synthetic sizing. Like their real fur counterparts, synthetic brushes come in a variety of styles and cater for all artists, from the soft touch painters to those who prefer a stiffer brush. The quality of the bristles is now just as good as the real sables and they give a wider range of texture and spring. 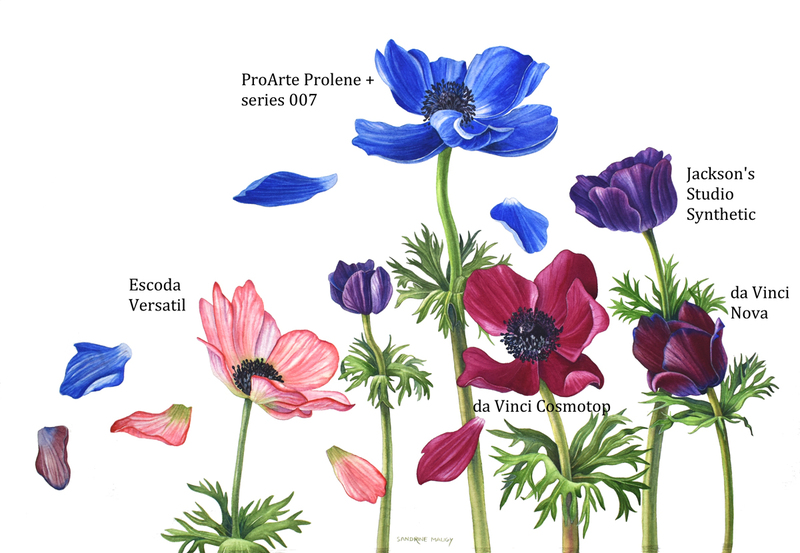 Brush test anemones: Each anemone was painted with a different brush. You can see Sandrine Maugy’s selected range of vegan brushes here. 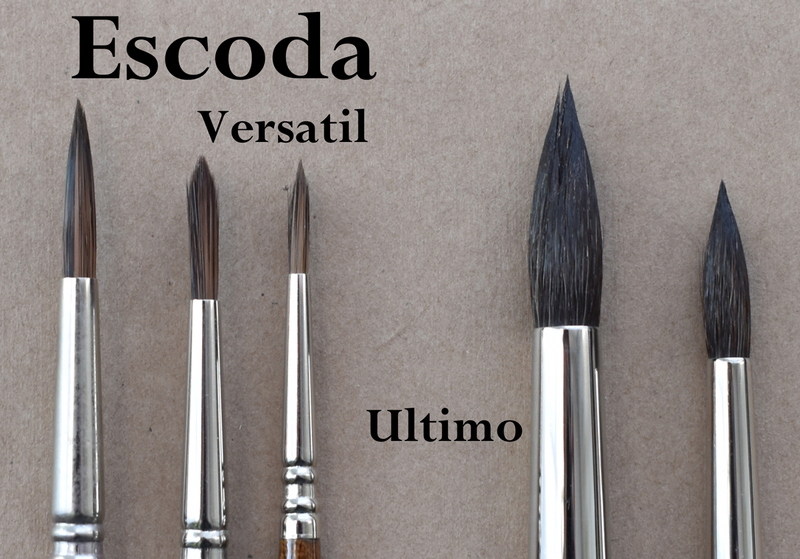 If you like a very soft brush that caresses the paper, try da Vinci casaneo Series 5598, Jackson’s Studio Synthetic series 505 and Escoda Versatil. Another stunning one is the Princeton Neptune. When I first tried it, I thought that there had been a mistake and that I had been sent a natural hair paintbrush instead of a synthetic. If you are a fan of translucent glazes, the Neptune will float above the previous washes without disturbing them in the slightest. 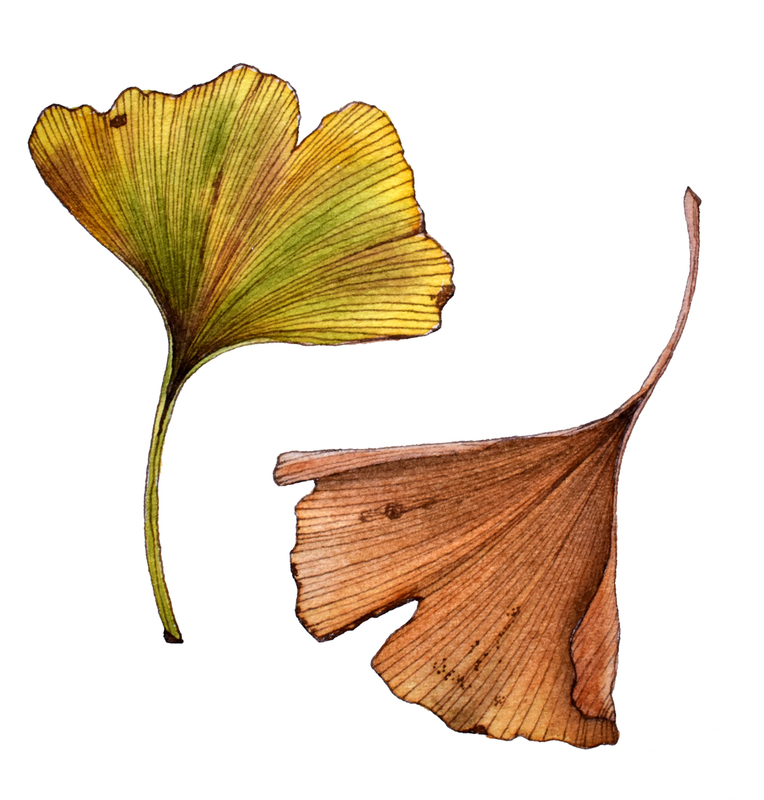 Ginkgo biloba: These leaves were painted with the Princeton synthetic squirrel. The soft bristles slightly teased the ink lines, blending them without erasing them. 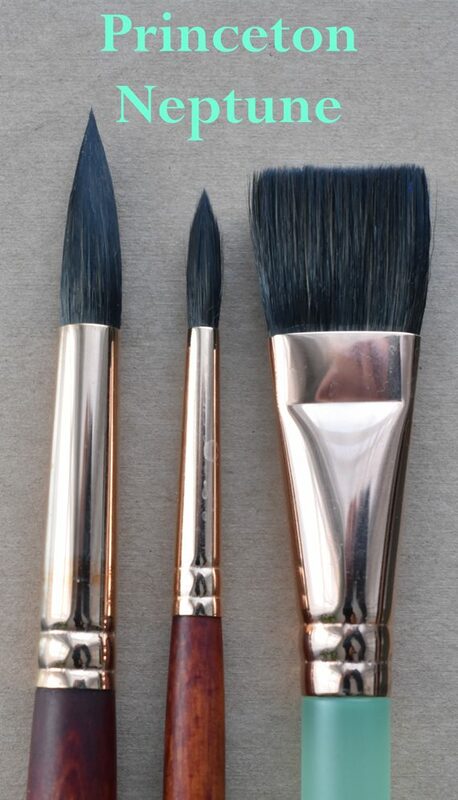 If you prefer medium texture with a good spring, ProArte Prolene + series 007 is a great brush. It is well balanced in the hand and responds well to gentle pushes, bouncing back in shape while giving you control in wet-in-wet washes. The da Vinci Cosmotop and Jackson’s Onyx are also springy without being scratchy. If you like a strong, stiffer brush that can lift washes and give more control, the da Vinci Nova and Jackson’s Artica Toray have firm and less absorbent bristles. 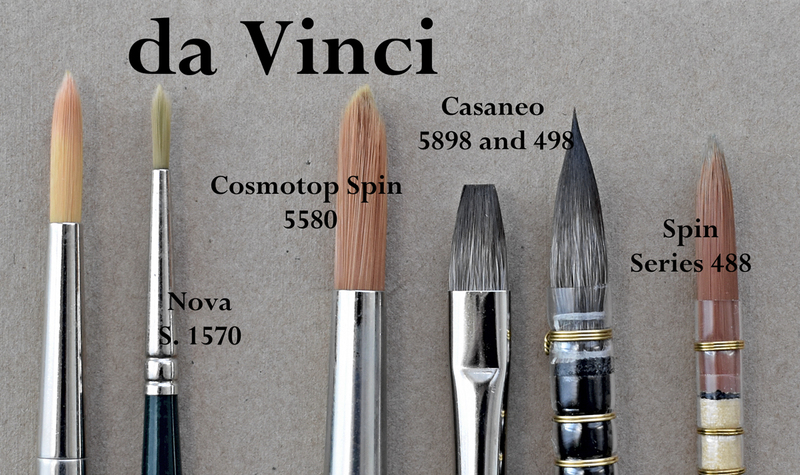 If you are partial to a quill brush, try da Vinci Casaneo 498, Jackson’s Raven 528 or da Vinci Spin synthetics 488. Brush test Raven: The Raven by Jackson’s is a synthetic quill brush with soft bristles. It is absorbent and carries a lot of water and paint. It is perfect for loser wet-in-wet washes and thin glazes. For the miniature painter, Princeton have created the mini-detailer series 3050 R, a lovely brush with a shorter handle and a long pointed head that goes down to size 20/0. This should allow you to make yourselves an animal-friendly kit for your art practice. I am preparing a series of videos on my YouTube channel in which I will test the brushes mentioned in this post. You will be able to watch as I use them and comment on their performance. In the meanwhile, happy Veganuary and happy painting! 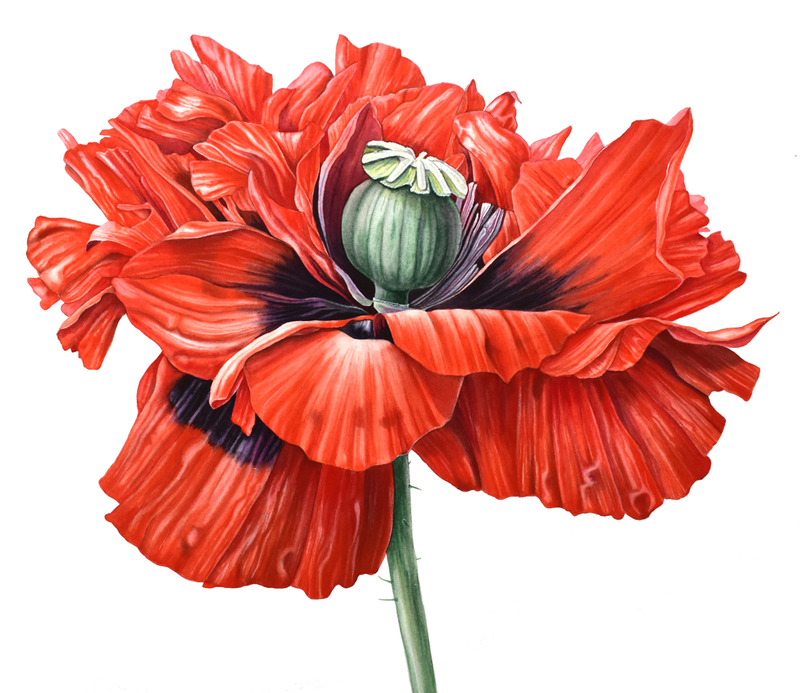 Sandrine Maugy is a well known botanical painter and a regular contributor of articles to the Artists & Illustrators Magazine, she has also published a beautifully illustrated Botanical Painting book on advanced colour-mixing theory and painting wet-in-wet when watercolour painting. She runs a very informative blog and an exciting, inspiring YouTube which is worth regularly checking for new advice and tips. Visit her website and her Instagram @sandrinemaugy to see more of her work and find out about her practice. Also, don’t forget to subscribe to Sandrine’s YouTube channel, if you want to see her upcoming series of videos. View vegan art materials on our shop here and all of Sandrine Maugy’s selected vegan brushes in this section. A long standing member of the Jackson's Blog team, Tegen loves to write about projects within the world of contemporary art, whether it's kick-starters, conceptual activism or exhibitions. In her own work her focus lies in experimentation, and unearthing the true potential of the materials she works with. like me will surely appreciate. Thank you Maria for your kind comment, we’re so glad Sandrine wrote it for us, it certainly is helpful! información sobre artículos de acuarela veganos. animales en nombre del arte. No hay problema, me alegra que lo hayas disfrutado. Vuelve al blog para más publicaciones de artistas veganos pronto. We totally agree that it’s helpful to have as much information as possible, so you can make informed choices! HOPE TO CONTINUE THIS AGAIN IN FUTURE. That’s wonderful, I’m so glad you find the site interesting and useful! Lukas 1862 watercolour paints are also vegan. Hey Alison, that’s good to know, thanks for sharing!